In the television categories, which were formerly handed out at a separate Critics’ Choice Television Awards ceremony but were recently merged into a single show, the FX miniseries “Fargo” led all series with eight nominations. “The Leftovers” and “Transparent” followed with six nominations each, while “Black-ish,” “Mr. Robot” and “Penny Dreadful” received four. The awards will be handed out on Sunday, Jan. 17 at Barker Hangar in Los Angeles, at a ceremony hosted by T.J. Miller and broadcast live on A&E, Lifetime and LMN. The Critics’ Choice film categories tend to be a fairly reliable predictor of Oscar nominations. In the six years since the Academy and Critics’ Choice expanded to 10 Best Picture nominees, almost 80 percent of the Critics’ Choice Best Picture nominees have gone on to receive Oscar nominations in that category. In every year except 2011, though, one film overlooked by the critics has subsequently landed an Oscar nod, with “District 9,” “The Kids Are All Right,” “Amour,” “Philomena” and “American Sniper” turning that trick. Critics’ Choice nominees in the acting categories have about a 70 percent success rate at receiving Oscar nominations. Notably missing: “Steve Jobs,” “Joy,” “The Hateful Eight,” “Creed,” “Straight Outta Compton,” “The Danish Girl” and “Beasts of No Nation,” all of which did receive nominations in other categories. The field-leading 13 nominations for “Mad Max: Fury Road” were helped out by the fact that it received nominations in four action-movie sci-fi/horror movie categories in addition to nine nods in regular film categories. In the same way, the nomination total for “The Big Short,” which received seven, was boosted by three nods in the comedy categories. If you just count the categories that are also used by the Academy Awards, “Mad Max” ties with “Carol” and “The Revenant” with nine nominations, followed by “The Martian” with eight, “Spotlight” with seven and “Bridge of Spies,” “Brooklyn,” “The Danish Girl” and “The Hateful Eight” with five. 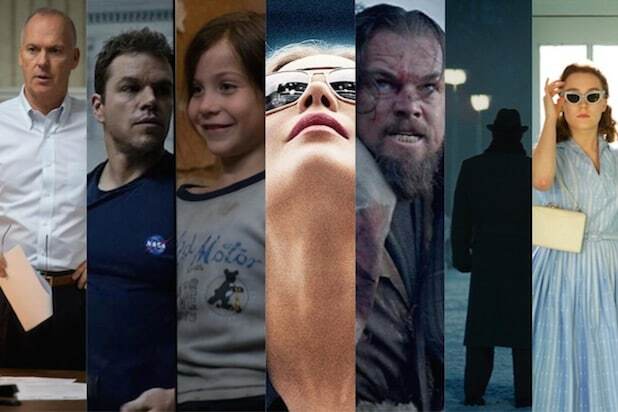 The acting categories, all of which included six nominees, cast a wide net, including most of the recent SAG nominees and adding Matt Damon for “The Martian,” Jennifer Lawrence for “Joy,” Charlotte Rampling for “45 Years” and Charlize Theron for “Mad Max” in the lead categories, and Paul Dano for “Love & Mercy,” Tom Hardy for “The Revenant,” Mark Ruffalo for “Spotlight,” Sylvester Stallone for “Creed” and Jennifer Jason Leigh for “The Hateful Eight” in the supporting categories. Surprisingly, Michael Keaton missed out once again for “Spotlight,” while his castmates Ruffalo and Rachel McAdams were nominated. Unlike the Golden Globes, which refused to accept Rooney Mara for “Carol” and Alicia Vikander for “The Danish Girl” as supporting-actress contenders and instead nominated them in the best-actress category, Critics’ Choice voters gave them both supporting-actress nominations. On the television side, the Best Comedy Series and Best Drama Series categories reflected a broad range of networks and platforms, with nominees from broadcast networks (ABC’s “Black-ish,” Fox’s “Empire” and “The Last Man on Earth,” The CW’s “Jane the Virgin”), basic cable (USA’s “Mr. Robot,” Lifetime’s “UnREAL,” FXX’s “You’re the Worst”), premium cable (Showtime’s “Penny Dreadful,” Cinemax’s “The Knick,” HBO’s “The Leftovers”) and streaming (Amazon’s “Catastrophe” and “Transparent,” Netflix’s “Master of None”). ABC, HBO and FX led all networks with 14 nominations each, followed by FOX with 12. Among streaming services, Amazon landed eight nominations and Netflix five. The Critics’ Choice Awards are voted by members of the Broadcast Film Critics Association (BFCA) and the Broadcast Television Journalists Association (BTJA) , linked organizations that have been handing out film awards since Tk and television honors since TK.